Disney offers many fascinating tours on a variety of topics, taking guests to various locations on Disney World property. For example, you can swim with Dolphins or learn about the gardens in Epcot, and you can Segway through the woods at Fort Wilderness. Many of the tours take guests behind-the-scenes. The tours vary in length, and for most of them you’ll be on your feet almost the entire time. Many of these tours fill up well in advance. Call (407) WDW-TOUR [939-8687]. 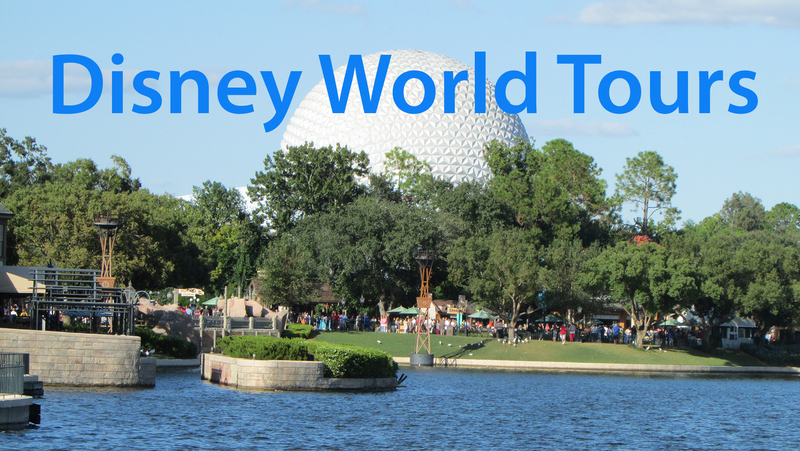 Here’s Walt Disney World’s tour page that lists all the current tours. Some tours take place indoors and weather is not a factor. For others, it’s of great importance and the weather can make or break your day. For anyone who has difficulty with heat, sun or being outside in the rain, we would absolutely recommend only taking a tour that’s mostly or all indoors. Or if you choose to take a tour that has you outdoors much of the time, only do it in the winter when temperatures tend to be more mild and there’s usually less chance of rain. People in ECVs and wheelchairs can participate in several of them, including Magic Kingdom’s Key’s to the Kingdom and Epcot’s Behind the Seeds tours. Check with the reservation cast member to determine which tours you can participate in. Some tours include some traveling on a non-standard bus or van. Although it’s not required, it’s really important to let them know in advance that you’re in a wheelchair or ECV so they can have an accessible vehicle ready for you, and so they can save a spot for you on the vehicle. Also let them know of other disabilities or special needs that are relevant. On a recent tour, one member of our party was using an ECV (electric convenience vehicle). The guide was very sensitive to her needs, guiding her to elevators when necessary. There were times when the group walked through crowds and she found it challenging to keep up. Though she lagged behind sometimes, she was always able to catch up without getting separated from the group. However it was a relatively low crowd period. It may be very challenging to keep up with the tour during peak crowd times, or with a manual wheelchair. Some of the tours include Segways, so you must be able to stand for the duration of the tour, balance and utilize a Segway for those tours. We asked if wheelchair riders could participate in their wheelchairs or ECVs on Segway tours, and this is not permitted. During the tour your tour guide may use a sound system. You’ll be given a unit that clips onto your clothing, with an attached ear piece that fits over the ear lobe. This permits you to hear the tour guide, and the sound level is adjustable. There should be a few pre-planned bathroom breaks, where the guide offers the group the chance to stop. If anyone has an urgent need, the tour guide should be able to make an unplanned stop if it’s at all possible, but keep in mind that an unscheduled stop means that the entire group will be waiting for you. “On the Keys to the Kingdom tour, lunch was served at Columbia Harbour House, a quick service restaurant. Before the start of the tour, when we arrived at check-in, a cast member asked us to choose our meals from a picture and word menu. The meal was waiting for us at our pre-assigned seat at the restaurant when we arrived. We were taken to the upstairs dining room which was quite calm and cool, and a great environment to unwind in. Do you have additional tips or opinions on the tours? Please comment below. If you have any questions, join our facebook group called Walt Disney World Made Easy for Everyone now.